My colleague John Noel recently wrote about efforts in Congress surrounding carbon capture, utilization and storage (CCUS) and enhanced oil recovery (EOR). First, he laid out why the bipartisan Senate Bill dubbed the FUTURE Act, which would increase the tax credits for CCUS and CO2-EOR, is a bad idea. Next, he detailed how oil industry interests are working simultaneously to de-regulate CO2-EOR and weaken the monitoring and reporting requirements that are necessary to make sure injected carbon actually stays in the ground . Click here for the printable fact sheet: CO2-EOR: A Threat to Drinking Water and the Environment. Earlier this year, we collaborated with a team of researchers from John Hopkins School of Advanced International Studies to delve into issues surrounding various methods of enhanced recovery. The research helped uncover several threats to drinking water from CO2-EOR, along with the alarming fact that regulators at both the state and federal levels lack the data, financial and staffing resources, and regulatory tools to ensure the safety of EOR. Read our full report on EOR here. 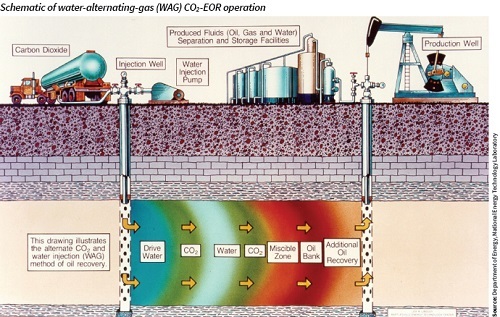 WAG followed by gas, in which a cheaper gas such as nitrogen is injected following the CO2 injection cycle. Water consumption, acquisition, and competition with other uses. CO2-EOR also presents unique threats to water and the environment, which can make this production technique potentially more environmentally harmful than other methods. 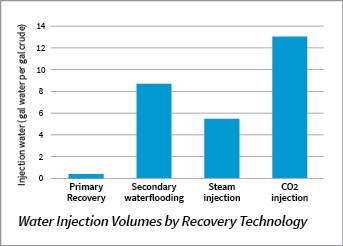 CO2-EOR is one of the most water intensive forms of oil production, requiring an estimated 13 barrels of water for every barrel of oil produced on average, more than other forms of EOR. EOR may utilize freshwater, which can present competing supply issues in water scarce areas. Most commonly though, EOR utilizes oil field wastewater, also known as produced water, which can be high in naturally occurring or added chemicals. Injecting, separating and disposing of high volumes of contaminated fluids presents risk of spills and leaks, and management challenges. Since EOR often occurs in older oil fields, outdated well construction standards not designed for CO2-EOR conditions may increase risk of equipment or well failures. Blowouts from CO2-EOR injection can and do occur. While there is a lack of comprehensive data on the risk or frequency of blowouts, numerous CO2-EOR blowouts have been recorded over the last 30 years. When CO2 reacts with water in oil-producing formations, carbonic acid is produced, creating a corrosive environment. This reaction increases the risk of degradation and corrosion of equipment, and amplifies the threat of leaks and blowouts. The acidic environment can mobilize and dissolve elements and compounds that can impact drinking water sources, such as boron, barium, calcium, chromium, strontium, depending on the formation. Blowouts can pollute the surface environment if produced fluids, oil, and drilling muds are brought up the well are discharged. In 2011, a 37-day long blowout of a Denbury Resources well in the Tinsley Field, Mississippi, resulted in the removal of 27,000 tons of contaminated soil and 32,000 barrels of contaminated fluids. Blowouts can also impact air quality. In addition to reversing any potential climate benefits of CO2 injection, large CO2 releases can harm local wildlife and people. The Tinsley Field blowout led to health impacts for first responders and oil field workers, and the asphyxiation of animals in the area. 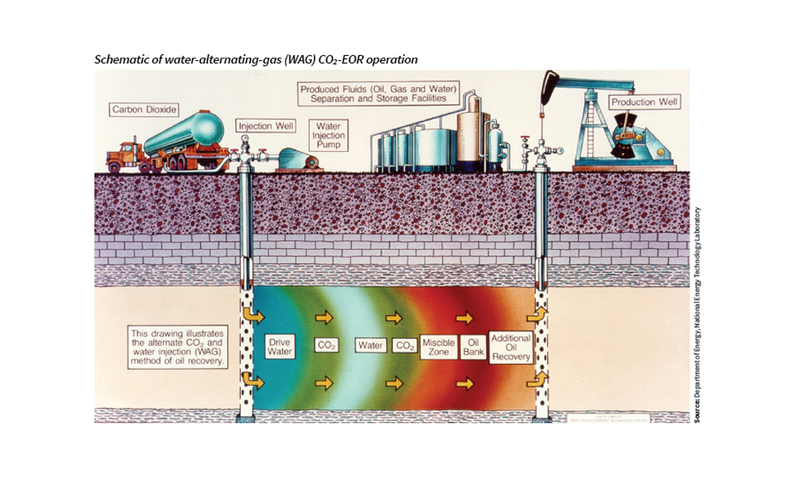 Finally, since CO2-EOR often extends the life of an oil field, sometimes by decades, the threats to water, air, land, and health, are all extended. Research has found that older oil fields have increased environmental (including climate) impacts, as dirtier, harder to reach oil is produced. More energy is required to extract and refine crude from older oilfields. Additionally, as equipment ages, the likelihood of failures, spills, and leaks increases. Proponents of EOR, often claim that extending the life of an oil field is preferable to drilling new wells, yet that assumption may not always be true. It’s important to recognize that the current effort in Congress to expand tax credits for CO2-EOR, would also incentivize threats to drinking water. Regardless of how CO2-EOR factors into the long-term viability of CCUS, incentivizing more CO2-EOR without adequate protections for drinking water is reckless.